The Nonverbal Revolution of Pope Francis with a little help from McLuhan Dr. Peter Gonsalves, Associate Professor, Faculty of the Sciences of Communication Salesian Pontifical University, Rome. (This article is an excerpt from his forthcoming book on Gandhi and the Popes). As I put the finishing touches to this article in the second week of October 2013, Jorge Mario Bergoglio is entering his eighth month as Pope Francis. In a little over two hundred days of his papacy, he has already secured a special place in history for the informal titles he has garnered ever since he assumed office in mid-March. He has been called ‘the pope of surprises’, ‘the pope for the poor’, ‘the people’s pope’, ‘a miracle of humility in an age of vanity’, ‘a man of peace and purpose and a voice for the voiceless’. One journalist called him ‘the least popey Pope in papal history’. Most Vatican observers are convinced that an unprecedented ‘revolution is underway’. Undoubtedly, during his first seven months Pope Francis has set the tone of his papacy which has led to a change in the public perception of the Catholic Church. News reports have recorded a major transformation marked by an increase in attendance at church services and a renewed interest in Catholic charities. This global phenomenon, perhaps the most talked-about of the year 2013, has been christened the ‘Bergoglio Effect’ and the ‘Francis Effect’. It has also taken the mass media by storm. During his first hundred days in office, news agencies and mass media companies aggressively vied with each other to be the first to publish a new episode, a striking metaphor, a catchy photograph or a touching sermon. Statistics of social networking sites registered a giant leap in papal enthusiasm. At the end of March, barely two weeks after his appearance, data revealed that Pope Francis was being ‘searched’, ‘followed’ and ‘shared’ by billions. It all began at the loggia of St. Peter’s Basilica. As soon as Pope Francis emerged from behind the red curtains, he smiled, waved and then stood motionless as the band played and the people in the square cheered enthusiastically. He greeted them and invited them to pray for the bishop emeritus, Benedict XVI, for the Church of Rome, and for the whole world. He concluded in a manner that was to bring to light his most visible characteristic: humility. Yet, even before his greeting, his very appearance had broken through centuries of sacrosanct papal tradition. Arthur Urbano, a scholar of early Christianity who has studied the representation of clothing in early Christian literature and art, highlights the revolutionary aspects of Bergoglio’s attire. More ‘messages’ made the headlines in the weeks that followed. His papal ring would neither be brand new nor solid gold, just gold-plated silver made from a mold created for Pope Paul VI. His papal shoes would not be elegant crimson like those of his predecessors but ordinary black like the common man. Hours after his appearance, he chose to return to the hotel with his fellow cardinals in a bus rather than in the escorted papal limousine. At the hotel he collected his belongings and showed up at the reception to pay his own pre-conclave hotel bill. He shunned life in the papal apartments – the opulent 12-plus-room in the Apostolic Palace overlooking St. Peter’s Square – choosing instead to reside in a more modest accommodation at the Vatican’s guest house. The morning after he travelled with his Cardinal-electors to the hotel by bus, he presided at the mass but did not read the speech prepared by the Secretary of State, as was the long-standing tradition. He spoke off the cuff, commenting on the Scripture readings while maintaining eye contact with his audience.He stood as he preached and without the mitre – unlike his predecessors who read the homily while seated on the papal throne. As for his mitre, it was not embroidered in gold but made of simple cloth like the one he used in Buenos Aires. Two weeks after his election, on Holy Thursday, he began by demonstrating the type of Church he wanted to see. It was the day Catholics commemorate how Jesus invited his apostles to be servant-leaders by bending down to wash their feet. It was an action that was reserved for Roman slaves not for teachers. Like Jesus, Pope Francis was transgressing the dictates of dramaturgical conventions. 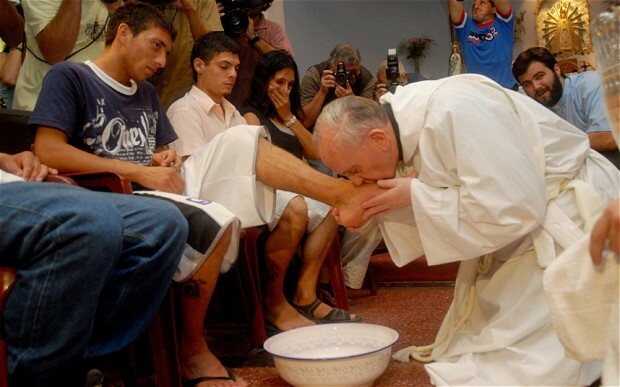 Whereas his predecessors used to wash the feet of twelve priests amidst sacrosanct symbolism in the gigantic Archbasilica of St. John Lateran at the heart of Rome, Pope Francis reached out to the nondescript Casal del Marmo Juvenile Detention Center and knelt down to wash the feet of twelve young offenders, ten boys and two girls, not all of them Catholics. In the weeks and months that followed, there were more significant ‘massages’5 in servant-leadership. He visited sick children and their parents at a local hospital. He celebrated the feast of the Trinity with parishioners on the outskirts of Rome. In summer, while many in Rome were holidaying, he set out for the small Italian island of Lampedusa, the first port of call for illegal immigrants from parts of Africa. He paid a visit to the people of Varginha, located within the favela of Manguinhosto in the north of Rio de Janeiro, Brazil. He dropped in at the Jesuit-Run Astalli Center that receives thousands seeking asylum in the heart of Rome. Here he spent time listening to refugees and consoling them with words of hope.